This is one of the best all around wildlife wonderparks in Florida that I have experienced. If you ever get the chance to see this amazing park, you will be happy you did! It is worth the drive from wherever you are. This park will live in my memory as an amazing stage for some amazing wildlife such as manatees, alligators, panthers, bear, waterfowl, reptiles, and even a hippopotamus. I loved the greeting center with it's informative kiosks and environmental displays. I loved the peaceful boat ride up the Pepper River towards the wildlife island. I loved the wildlife walk on a new raised boardwalk system that was safe and clean to travel on, even in the rain. I loved the underwater "Fish Bowl", a floating underwater manatee observatory. With windows placed all the way around it provided for some wonderful views of the deep spring of Homosassa. We saw turtles,an amazing number of huge snook, black drum, sheephead, and of course, some very happy manatees! The rain picked up and prevented us from going all the way to the West side of the park where the Children's Environmental Education Center was located. Bryan was worn out by that time anyways. I would love to come back soon and re-visit this park on a sunny day, and check it out! 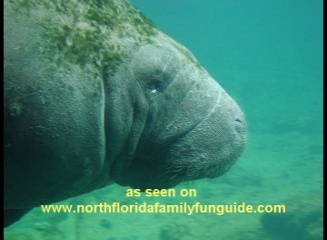 Truly, this is a wonderful family outing that is perfect for your family, and even for visiting guests to see what the real Florida is all about.